There I was staring at the Independent on the District Line this lunchtime when I heard this slightly high-pitched voice coming from a seat nearby. “Can I have a sip of your cappuccino?” said the voice. “No, you might burn yourself” said a man’s voice. I looked round to see small brown bear wearing a red hat who was now asking another man next to him for a sip of his water! Some fellow tube passengers didn’t know where to look. Some moved slowly away, others hid behind their books or pretended to read the adverts again. Turns out this wasn’t just any bear. 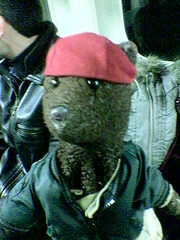 This was Bearsac who has his very own website at bearsac.com where you visit his house and check out his photo album. He’s travelled extensively and also seems to have spent quite a lot of time hanging around Borehamwood as he’s been photographed with virtually the entire cast of Eastenders. Not to mention quite a few members of the Arsenal squad including Thierry Henry and Robert Pires. If you’re a Numanoid there’s a treat in store (click on the picture hanging on the wall in the house). And if you’re feeling a little peckish there are a few recipes to try out in the kitchen. Bearsac is not politically affiliated (I did ask). And just to double-check I asked whether he was backing Cameron or Davis but he just gave me a “do I really look that stupid?” look.